Late Wednesday afternoon North Korea vowed to send missiles near the island of Guam after President Trump said their nuclear threats will be met with "fire and fury." The regime has also vowed "physical action will be taken mercilessly with the mobilization of all its national strength" in response to the UN Security Council imposing harsh economic sanctions against the country last weekend. Over the past few days cable news has given Americans the impression nuclear war is imminent and that it's time to panic. Not so. During an interview with Fox News' Brian Kilmeade last night, Guam Governor Eddie Baza Calvo said that although there is worry on the island, there isn't panic and people are being encouraged to go about their daily lives. "Obviously for our administration and for the people of Guam there is concern and worry but there is no panic. As you recall, going back to 2013, this is the third, fourth threat made to Guam as well as other bases in Asia as well as Hawaii and the west coast," Calvo said. "We encourage everyone to go through their lives and live them like any other day." "Our civil government is working in collaboration with the military regional command here that is prepared for any kind of contingency," he continued. "It's important to be very strong, but also calm." 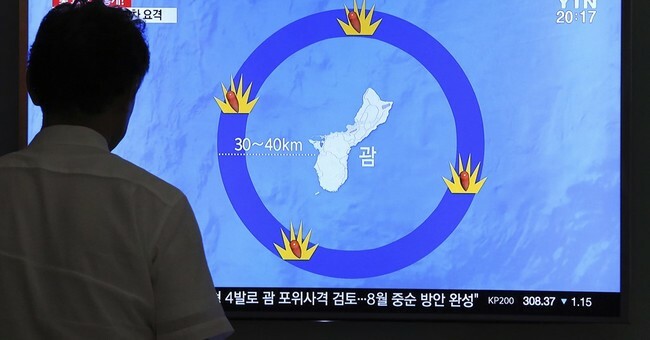 As Governor Calvo mentioned, this is not the first time North Korea has threatened Guam and the government has defense mechanisms in place should an attack occur. The Trump administration has made it clear this week North Korea's threats are unacceptable. "The United States and our allies have the demonstrated capabilities and unquestionable commitment to defend ourselves from an attack. Kim Jong Un should take heed of the United Nations Security Council’s unified voice, and statements from governments the world over, who agree the DPRK poses a threat to global security and stability. The DPRK must choose to stop isolating itself and stand down its pursuit of nuclear weapons. The DPRK should cease any consideration of actions that would lead to the end of its regime and the destruction of its people," Secretary of Defese General James Mattis said in a statement.